Fascinating villa from the end of the 19th. century on the hills around Verona (25 km). The villa belongs to a famous local family and among her guests we may remember Edward VIII. On the ground floor we find a large kitchen, WC, study with fireplace and a music room with a piano from the 19th. century. All these rooms lead to the very nice living-room with frescos from where you have access to the romantic garden with rare plants and a small bamboo wood. The original stair-case from that epoch leads to the first floor where you find the five bedrooms and one large bathroom. 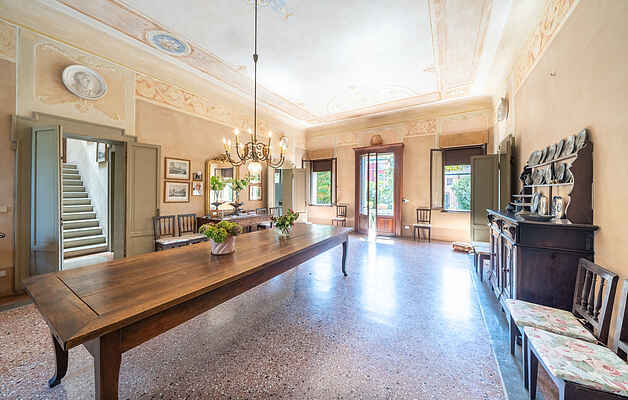 All bedrooms are connected by communicating doors and all the rooms of the villa still have the original frescos (partly renovated) and period furniture which makes you feel as living in the 19th. century. Ideal position for trips to Verona, Mantova (30 km), Venice (120 km) and to the lake Garda (Lazise 40 km) with its wonderful views and the famous amusement park. On the property and adjacent to the villa a small house inhabitated by other persons. Air conditioning in some rooms, to be paid upon the spot according to consumption.